Lost Lake Nature Park: Big Birds, Small Creatures and a Forest Full of Mushrooms! 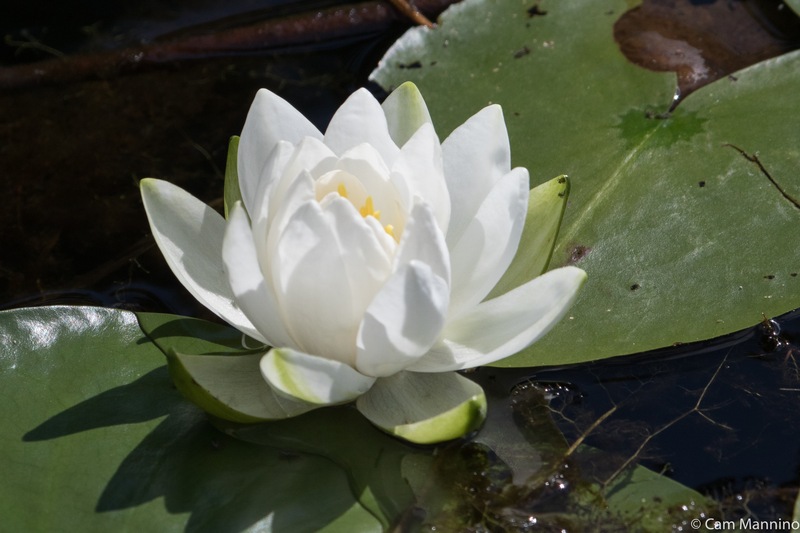 Fragrant Water Lilies (Nymphaea odorata) dotted the surface of Lost Lake in the last few weeks. I’m so glad that Lost Lake Nature Park isn’t really lost. It’s such a different sort of nature park. The round, blue eye of the kettle lake stares up into the sky. Lately, water birds have been feeding and making practice flights as they prepare to depart for warmer climes. Steep forested hills stretch around the lake like a friendly arm. And, I discovered to my delight, the oak-pine forest sprouts a surprising number of mushrooms in the autumn! I took several different kinds of trips to this interesting little park in September – once or twice on my own, once with the birding group and once with a group of avid mushroom hunters assisted by two well-informed guides who discerned the edible from the inedible. Such a diverse little park with its tall native grasses in the summer and its sledding hills in the winter – and something new to discover on every visit! Far across the lake one cool morning, a strangely gaunt Great Blue Heron (Ardea herodius) spread its wings for takeoff. I hoped that its ragged head and breast meant that it was simply molting, since I’ve read that they do a complete molt in early fall. A gaunt Great Blue Heron. I’m hoping the appearance is due to molting! 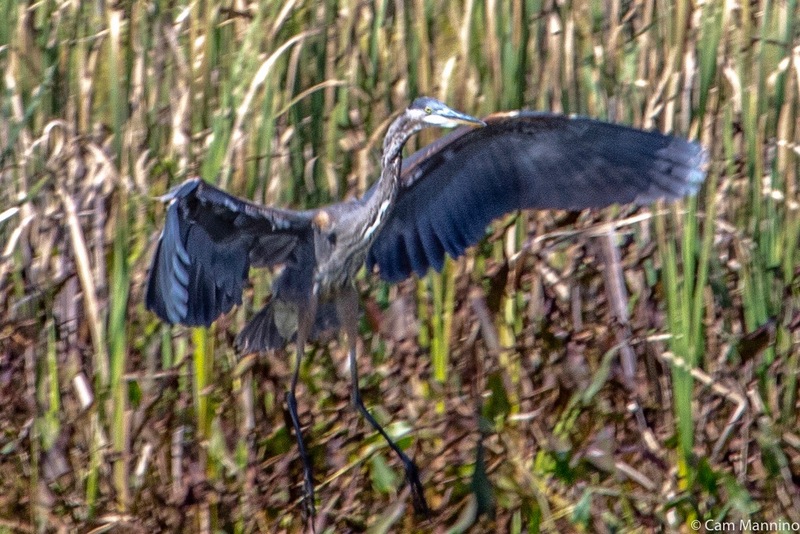 The ragged Blue Heron seemed to have a full complement of wing feathers. It eventually landed in a more secluded area at the eastern edge of the pond. 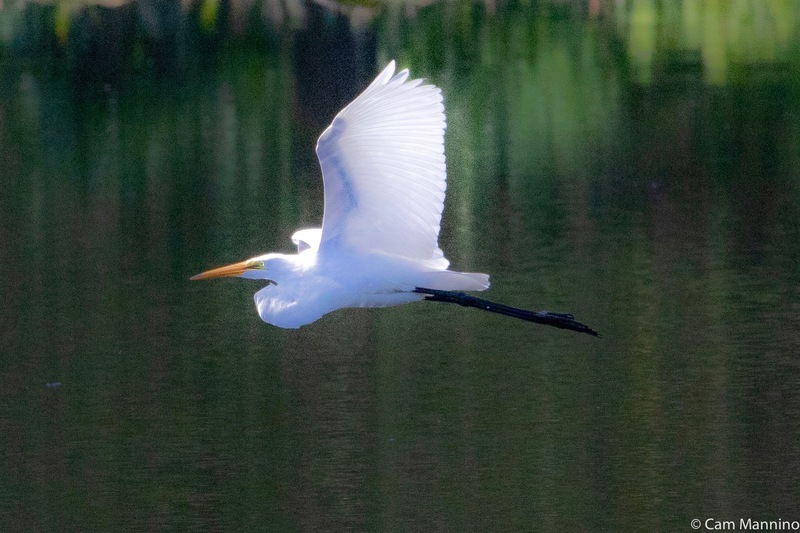 Across the pond, at the same moment, a healthier-looking Great Egret (Ardea alba) took its time fishing, before it too took a few turns around the pond as if exercising its flight muscles before migrating. 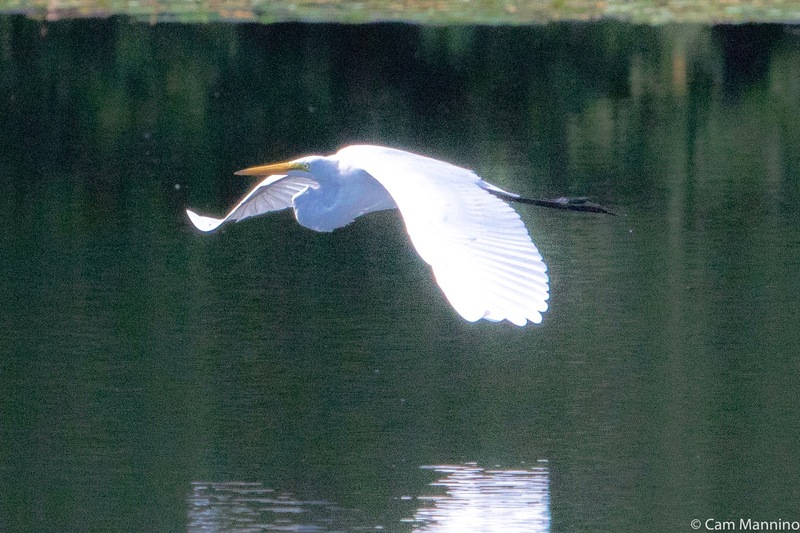 A fishing Egret suddenly rose into the air and took a quick turn around the pond. The yellow bill and black legs mark it as Great Egret. And how about that green eye, eh? 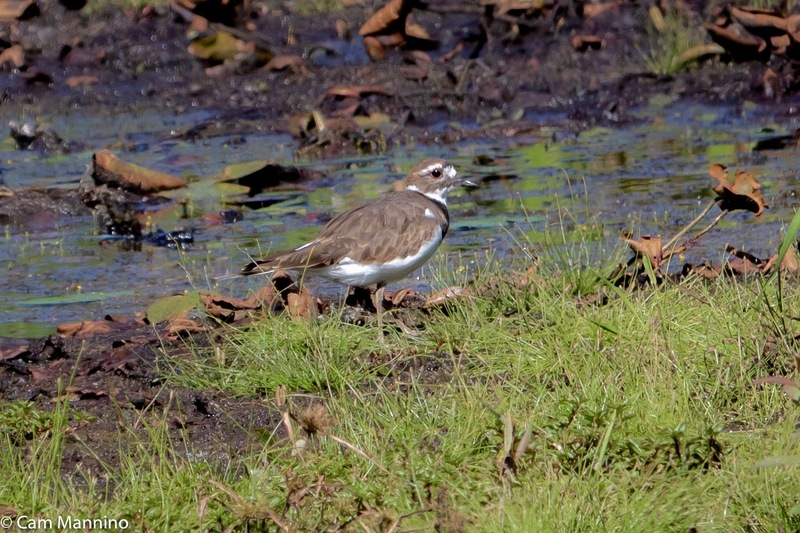 Hearing a high trilling call, I looked around for a Killdeer (Charadrius vociferus). For a while, I saw nothing on the muddy flats. But finally I spotted it near some bright green grass, assiduously poking its beak into the muddy shallows at one end of the pond. So often I can’t spot these little birds until they move because they blend so nicely with their surroundings! A Killdeer searches for insect larvae, snails or beetles in the muddy shallows of the lake. The Wednesday birders spotted a Muskrat (Ondatra zibethicus) steaming quickly across the lake. So clumsy on land, these furry fellows can really get moving using those swaying tails for propulsion. We birders watched it swim by and it gave us the eye as well! 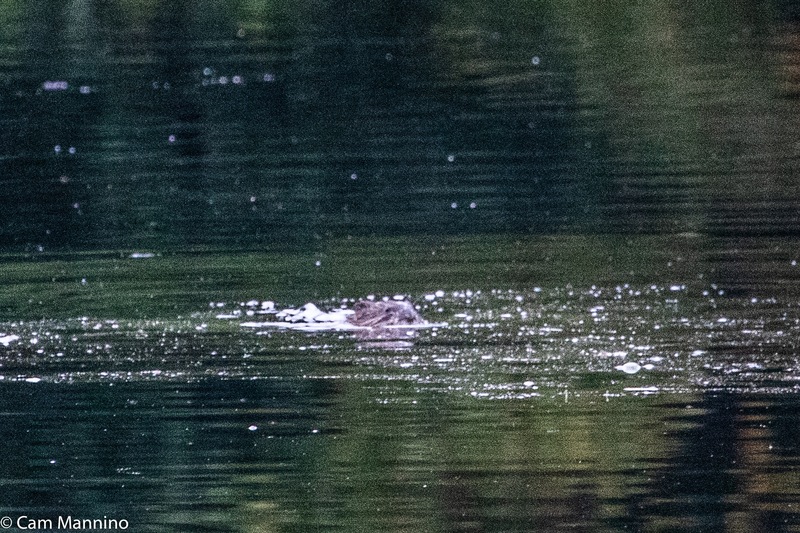 A muskrat steaming across Lost Lake while keeping an eye on the birders. 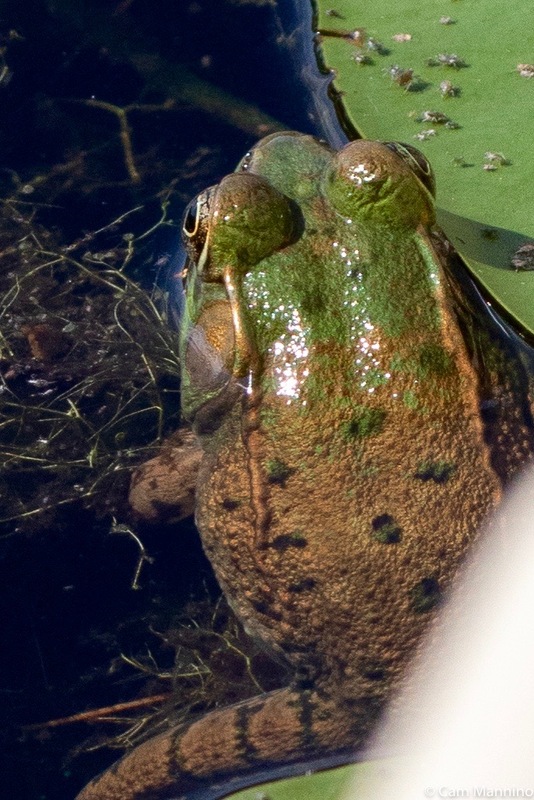 As I approached the dock on one visit, I heard a loud “Squeeeak” followed by a watery “plop!” And there under the edge of the dock crouched an alarmed Northern Green Frog (Lithobates clamitans melanota). It may have been a juvenile, since I’ve read that the young are more likely to squeak when caught off guard. Evidently other frogs, like Bullfrogs and Leopard frogs, are also known to make this odd sound, which is much like the noise that results from stepping on a plastic toy! A Green Frog squeaked loudly as it leapt to a safer perch underneath the dock. 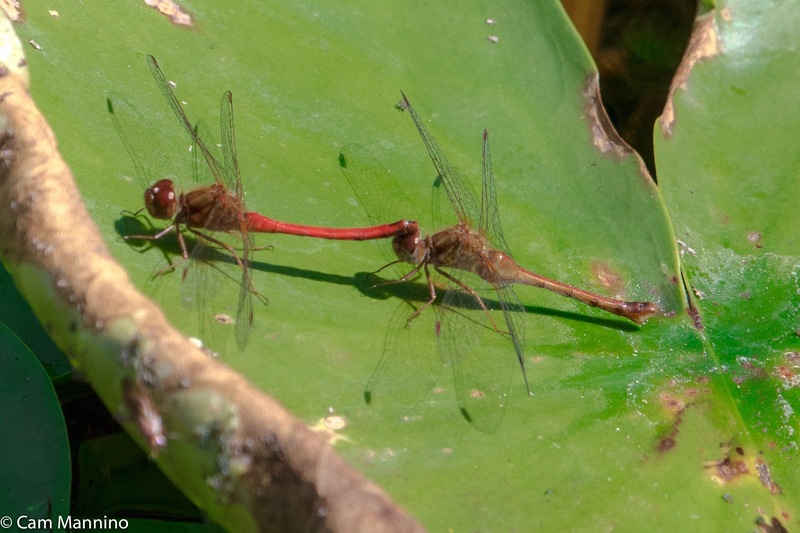 On the other side of the dock, two small red Meadowhawk dragonflies (genus Sympetrum) found a convenient lily pad on which to mate. As usual, the male held the female’s head firmly with pincers on its tail as mating commenced. These two seem to be Ruby Meadowhawks (Sympetrum rubicundulum), but there are several red Meadowhawks that look very much alike so I can’t be sure. A short time later they took off flying, still attached, while some frustrated males hovered nearby. The light sifts through the tree canopy on the hills that surround Lost Lake. If you take a hike up the sledding hill, or reach the top by following the path through the woods, you’re treated to a view of the undulating forest floor. In summer, the sunny side of the sledding hill is a-buzz with dragonflies, butterflies and native wildflowers. But at this time of the year, the lower, moist areas of the forest draw my attention. 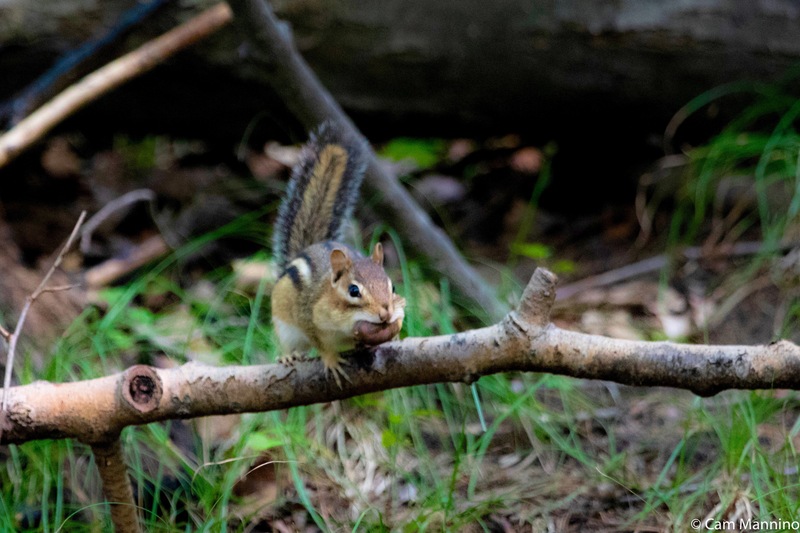 Almost any movement out the corner of my eye turns out to be a Chipmunk (Tamias striatus) zipping along a log or quickly diving into hollow tree trunks. This one had scored a nice big nut in its bulging cheeks. A Chipmunk with its mouth stretched around a sizable nut! As we birders passed by the woods near the road, a young fawn waited in the shade for its mother’s return. Female White-tailed deer (Odocoileus virginianus) leave their young for long stretches because their adult scent can attract predators, whereas the young have little or no scent. 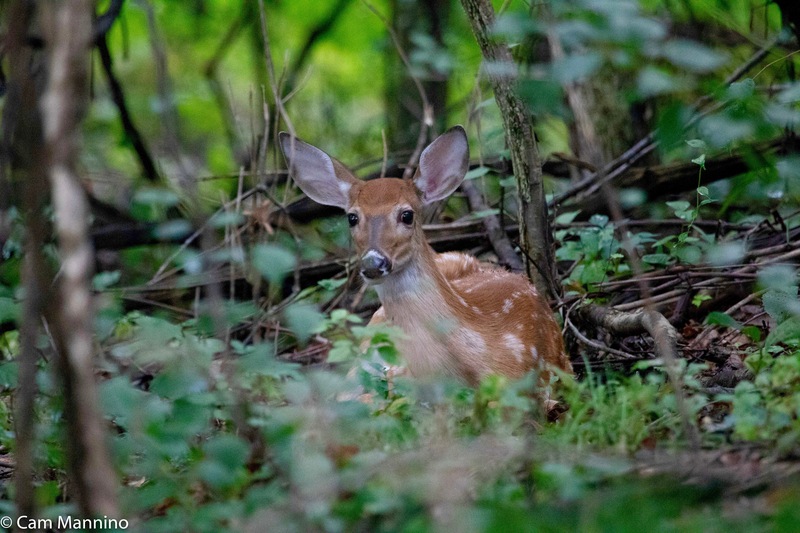 A fawn waits for its mother’s return in the woods at Long Lake Nature Park. 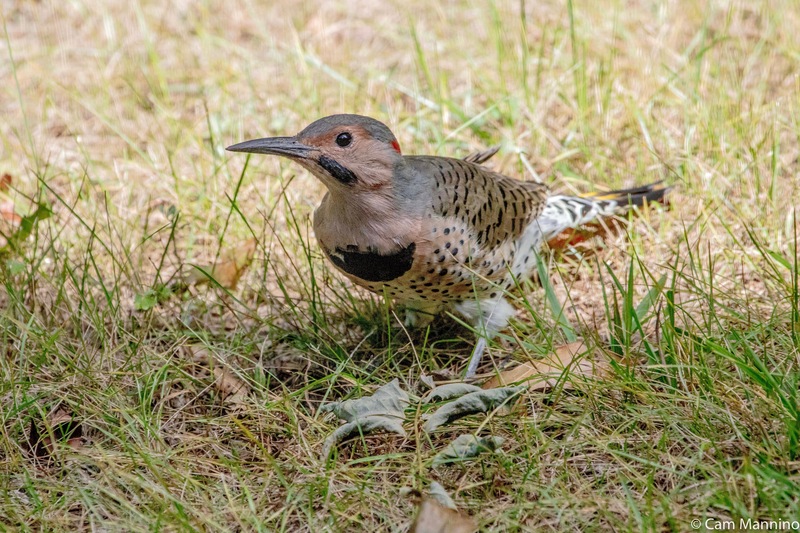 In the woods, I saw a Northern Flicker (Colaptes auratus) chased away from a huge tree hole by a Red-bellied Woodpecker (Melanerpes carolinus). The hole was big enough for a raccoon, so I think they must both have been interested for other reasons than nesting next spring! The birds were much too far away for a good shot with my camera in the dim light of the woods. But luckily, I saw this male Flicker hunting in short grass later in the week so you can at least see him up close. There are a few shade-loving, late season flowers in the forest now, like the modest Large-leaved Aster (Eurybia macrophylla) and Calico Aster (Symphyotrichum lateriflorum). I’m always happy to see any native blooms on these cool gray days, especially on the forest floor where, because of deer, wildflowers are rarer than they used to be. The Stars of the Show – the Mushrooms! Note: Picking plants, animals, fungi, and other natural parts of our natural areas violates park rules. Please leave them to grow, and for others to see and enjoy! 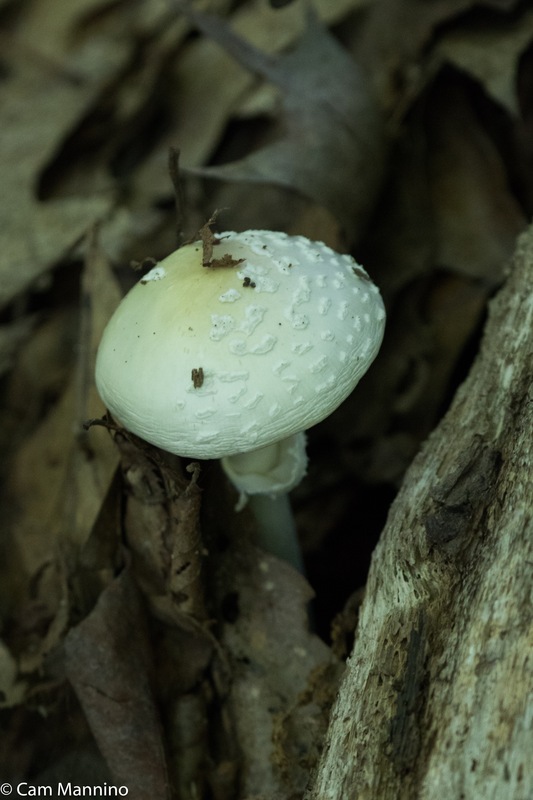 A toxic Amanita mushroom that I saw weeks ago at Stony Creek Ravine Nature Park. When in doubt, throw it out! Take an expert with you until you’ve really learned about mushrooms, which can take some time. Learn the Amanita mushrooms and don’t eat any of them! When eating a wild mushroom for the first time, always take only a small bite and refrigerate the rest, so you’ll have a specimen if you get a reaction. Never eat wild mushrooms raw. Do not eat decomposing or worm-eaten mushrooms. Don’t pick mushrooms from contaminated sites. Eat wild mushrooms in moderate quantities. The Pigskin Poisonous Puffball (Scleroderma citrinum). Puffballs, common mushrooms, are generally edible, our guide said. But NOT if they are the ones that are black inside! The cap of a toxic Pigskin puffball. Puffballs that are black inside are toxic and shouldn’t be eaten. Cortinarius mushrooms (genus Cortinarius) are generally toxic. The few that aren’t toxic are hard to identify, so best to avoid them all! The genus Cortinarius is a group of mushrooms to be avoided, since almost all are toxic. The Bluing Bolete (Suillellus luridus) turns blue when the underside is scored. Unfortunately, there are many look-alikes, one of which is toxic. So it’s best not to eat them unless you have a definite ID, and then only when cooked. The raw ones can cause gastric upset. The Bluing bolete mushroom is easy to mistake for a toxic version and must be cooked if an expert ID’s a non-toxic one for you. The underside of Bluing Bolete turns blue when scored as do some other mushrooms. Some Russula Mushrooms (genus Russula) are perfectly edible; others aren’t. So again, be sure to have a reliable expert guide you! Our guide told me this one was Hygrophorus russula which is edible, though it was a bit too old to eat. As you can see, it’s a gilled mushroom. The gills produce the spores (a mushroom’s “seeds”) which drop down and are carried away on the wind. The cap of a Russula mushroom – some are edible, some not, so beware! We did find “for sure” edible mushrooms. We found several edible mushrooms, too, but my notes weren’t clear enough, I’m afraid in most cases. My excuse is that I was taking photos, listening and trying to type in my phone at the same time! But the Cinnabar Chanterelle (Cantharellus cinnabarinus) is definitely edible. The underside of chanterelles have ridges that stretch down onto the stem rather than gills under the cap only. A few more fascinating fungi that may or may not be edible! Inky Caps (Coprinopsis atramentaria) start out bell-shaped like this and then flatten out. The guide told us they often grow on animal dung from the previous year, which kind of makes them a bit less appetizing in my book. Inky Caps start out as this bell shape and then flatten as they mature. They grow, the guide said, on dung from the previous year…hmm..
Old Man of the Woods (Strobilomyces strobilaceus) suits its colorful name. Sources say it’s edible, but most think the taste isn’t worth the trouble. It’s a polypore mushroom, meaning it drops its spores from the openings (pores) at the end of tubes on the underside. 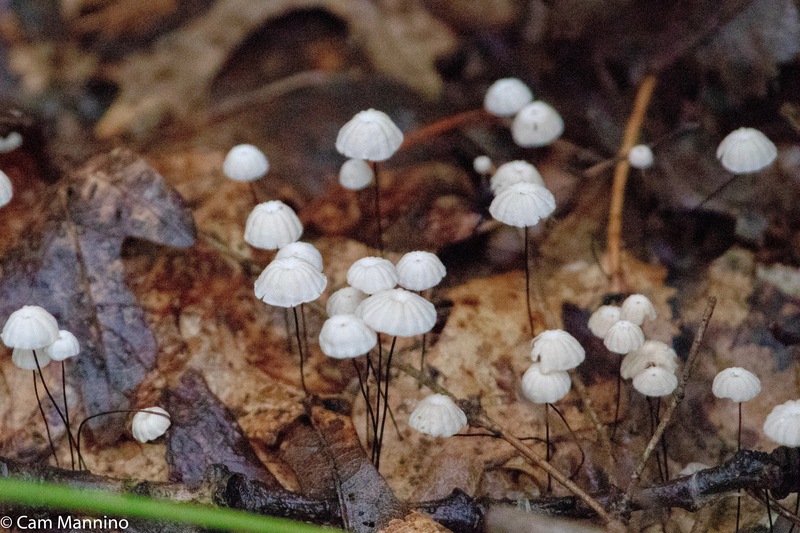 The birders spotted these tiny mushrooms with black stems on our Lost Lake Nature Park hike. According to the Mushroom Identification Facebook group, they are from the genus Marasmius, family Marasmiaceae, to which Shitake mushrooms(Lentinula edodes) belong – but I have no idea if these tiny mushrooms are edible. And they sure don’t look like Shitakes, do they? Marasmius mushrooms which may be in the same family as Shitakes but may or may not be edible. Whether edible or not, fungi have their uses. As the presenters pointed out, humans use them for dyes, cheeses, yogurts, wine, beer, breads (yeast!) among other uses. The “saprotrophic” mushrooms, which include the famous Portobello mushroom (Agaricus bisporus), are the recyclers of the forest. Along with bacteria, they decompose dead organic matter (plant or animal), thereby releasing carbon, nitrogen and essential minerals back to the soil. “Mycorrhizal” fungi, of which the toxic Amanitas are a member, partner with trees and plants to create giant webbed networks that gather essential nutrients and moisture for the trees/plants and may allow them to chemically communicate as well. The fungi benefit by feeding on the sugars that the plants can create through photosynthesis. So fungi deserve our thanks, even when they don’t end up on our dinner plates! 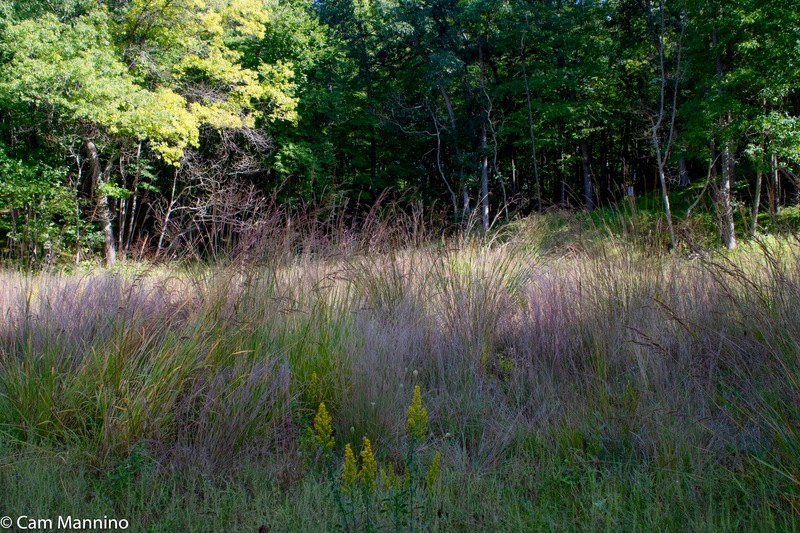 Native Big Bluestem, Little Bluestem and Indian Grass growing at the bottom of the sledding hill. So much to enjoy at this little park. In winter, the sledding hills fill with the laughter of big folks and little ones careening down the slopes. 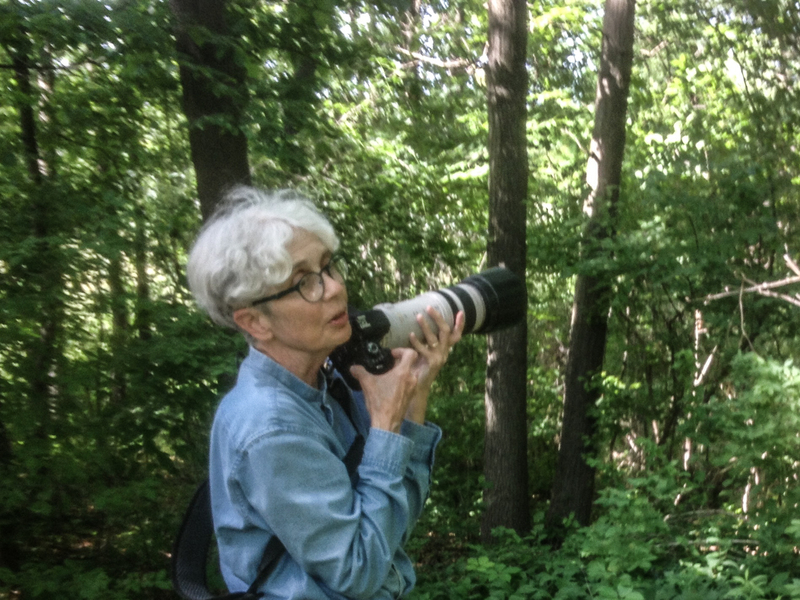 And in all the other seasons, the lake, the forest and the grassy hill host nesting birds, frogs, dragonflies, the occasional mink, native wildflowers – and humans, of course! Some learn to kayak or how to use a stand-up paddleboard at this park. Some practice yoga. And some come to bird watch or just take a short hike through a variety of habitats. Whether you come to meet friends, a squeaking frog or strange-looking mushroom, Lost Lake Nature Park will welcome you and send you home smiling. I can almost guarantee it. For information on the nature programming at Lost Lake Nature done in partnership with Dinosaur Hill Nature Preserve, click here, or click here for other fall nature programs at Lost Lake and all our parks.